Having obtained a degree in civil engineering he began his career in the dredging industry in the newly/formed survey division of Stevin Dredging. There he worked as Hydrographic Surveyor providing survey input for harbour design and project support. 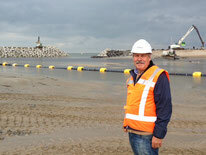 The following 10 years he spent working on international harbour construction in projects around the world. In 1982 he became Personnel Manager for the Oceonics PLC at Intersite Surveys in Haarlem, The Netherlands and later Group Personnel Manager. In 1988 he founded Dutch Onshore Offshore Recruitment BV (D.O.O.R.) an agency providing qualified Hydrographic-, Geophysical- and System/engineer personnel to the international oil and gas industries. In 2000 Skilltrade was set up in order to address the growing need for training of hydrographic personnel. Survey modules were developed for short/term courses, at that time primarily for the Dutch market, and has continued to develop new modules and additional course material resulting in a comprehensive programme in survey education. Johan Stam is currently engaged in cooperative efforts with both governmental agencies and representatives of industry in order to establish and promote survey education in Europe and abroad. Huibert-Jan started working for Skilltrade in 2000. He has been course-coordinator, editor and principal lecturer hydrography for all Skilltrade courses including the Hydrographic Survey Course. Huibert-Jan holds a BSc degree in Hydrography (Cat A), a BEe in Maritime Electronics (BEe) both from the Higher Nautical College in Amsterdam as well as a joint MSc in Geographic Information Management from Utrecht U, Delft U, Wageningen UR and the ITC in Enschede. Since starting to work in the early 1990's he has mainly worked for government agencies with short stints at dredging and offshore companies. Since 1999 he has specialized as a client representative on large(r) scale projects such as the sanitation of Ketelmeer-Oost, the construction of Maasvlakte 2 and the sandy beach reinforcement of the Hondsbossche and Pettemer Zeewering. Parallel to this he works as Information Manager at an inter-governmental body (Informatiehuis Water) which is responsible for collecting and distributing water related information . Finally Huibert-Jan has authored and edited many articles on GNSS, Geodesy and Standardization as well as both a book on GPS Surveying and the Handbooks of Offshore Surveying. Guus was born in 1955 in a seafarers family. After his study for teacher in Mathematics and Geography he got an offer to work at a shipping agency in Rotterdam. He worked as manager and director in several agencies, forwarding- and stevedoring companies. Since 1981 he teaches shipping agency. In 2000 he was invited to become senior consultant at the Shipping and Transport College in Rotterdam. In 2004 he finished a study “Maritime Science” in London followed by a post graduate degree in Port Management at the University of Ghent. From 2005 to 2013 he was director of the Maritime Institute “de Ruyter” in Vlissingen. Since 2014 he owns his own stevedoring company, is consultant and project manager and is course coordinator for the Skilltrade Hydrography CAT B course. Besides this he is member of the board of Prosea, a non-profit organisation who wrote the environmental model course for the IMO. In Malaysia he is one of the co-founders of the Netherlands Maritime Institute of Technology. Jan started to work for Skilltrade in 2014. Jan graduated at the Nautical College Noorderhaaks, Den Helder (NLD) in 1975. In 1978, he joined the Royal Netherlands Navy (RNLN) with special interest in hydrography and oceanography. After a number of seagoing hydrographic and oceanographic positions, Jan ended his hydrographic career afloat in 1994, commanding the survey vessel HNLMS Blommendal. During this period afloat he passed IHO-Cat. B in 1981 and IHO-Cat. A in 1986 at the Royal Navy Hydrographic School, Plymouth (UK). From 2000 onwards Jan was stationed in the NL Hydrographic Office in The Hague (NLHO), participating in procurement of hydrographic equipment, survey management and the build of the survey vessels HNLMS Snellius and Luymes. Later positions within NLHO included international hydrographic affairs and the full management of civil & military survey, meteorology and oceanography within the RNLN. He ended his naval career in 2011 when he was honourably discharged from the RNLN. Jan continued his hydrographic career as a self-employed consultant (CristalClear Consultancy) and volunteer.